Let's start with Jjim Dak 찜닭 | It's translated as "steamed chicken" and it is my ultimate #1 favourite Korean food!! 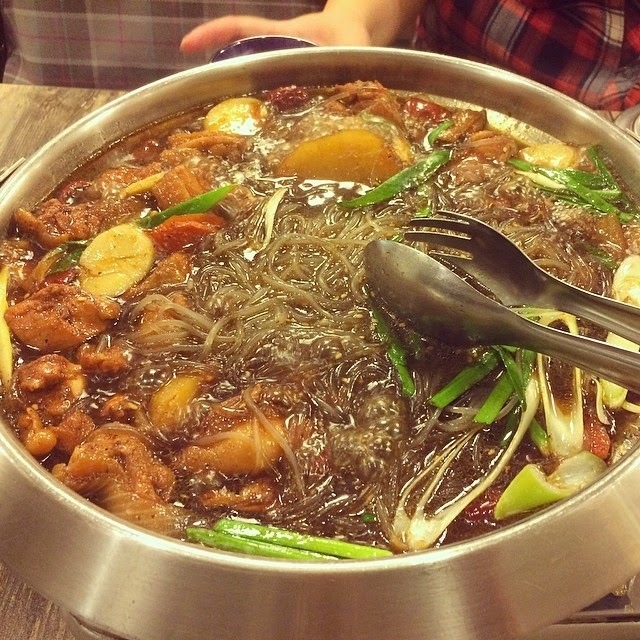 It is chicken with or without bones marinated in sweet soy sauce with vegetables and glass noodles. 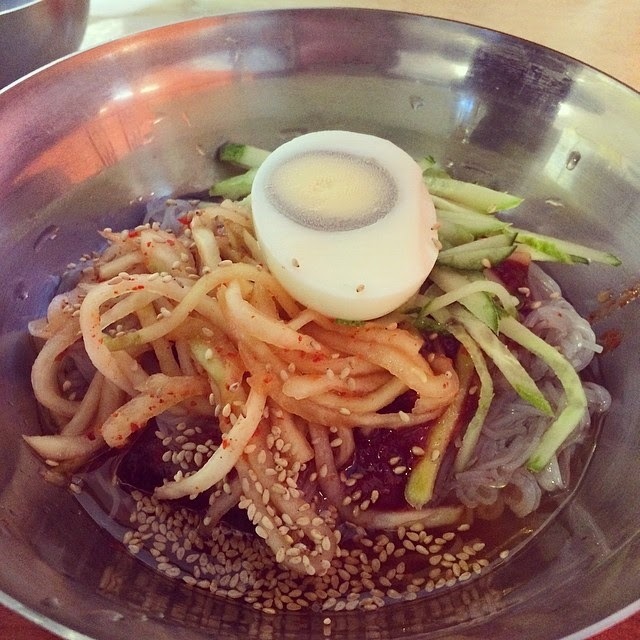 There are several restaurants in Seoul for Jjim Dak, but my favorite is Ewha Andong Jjimdak near Ewha University. The main reason why I particulary like this restaurant is that they serve it on top of a single gas stove. So therefore the dish will stay boiled and hot so that the ingredients really absorbs the sauce. Don't forget to choose the spiciness level! 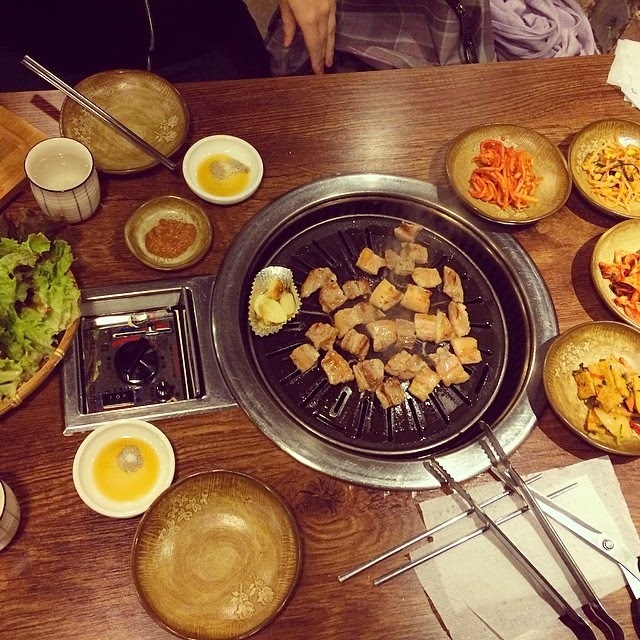 Everytime I eat this I get a foodorgasm..
삼겹살, Kalbi 갈비 etc. Different kinds of meat that you grill the meat yourself with (unlimited) side dishes to make wraps: lettuce, garlic, bean sprouts, kimchi and more. Yummy in my tummy shall I say. Chicken 치킨 | A commom Koren term: ChiMaek 치맥, which is a shortened Chicken and Mekju, which means Chicken and Beer. 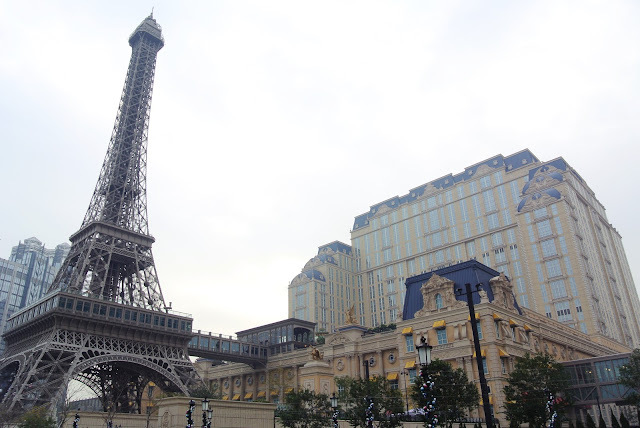 This popular duo is well known in Korea. But I don't drink beer so I only eat the chicken lol. Chicken in Korea means fried chicken (marinated with sauce). It is a popular dish to order for home delivery but also to eat in Restaurant. The most popular sauces are sweet&sour and soysauce. If you go to a chicken restaurant there are obviously more kinds of different kinds of chicken. 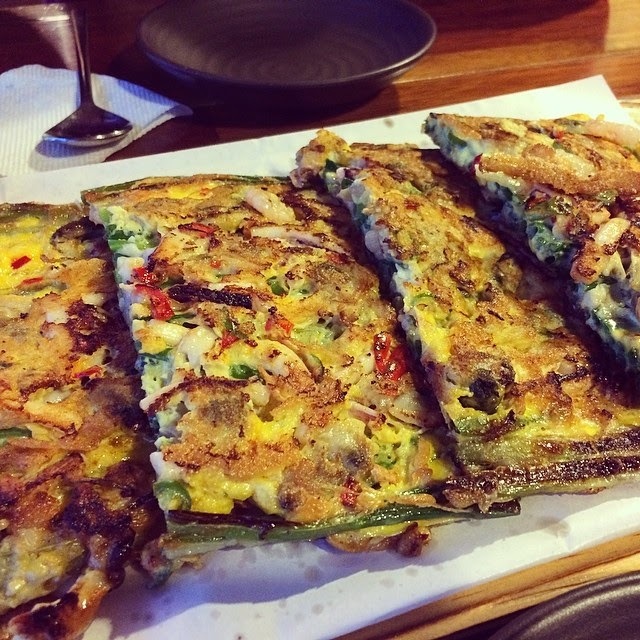 Pajeon 파전 | Korean pancake. They have different kinds of Pajeons, but the most common ones are: Green Onion (top picture), Seafood (bottom picture) and Kimchi. It is mostly combined with Makgolli, which is a Korean rice wine. Personally I really like green onions so I love this dish! Bibim Naeng Myun 빔 냉면 | Spicy Cold Korean noodles. It also comes in a non-spicy Mul Naeng Myun 물 냉면, but I like the spicy one the best! It is cold noodles with vegetables and red pepper paste sauce. A great dish if you want to eat something spicy and chewy on a hot day! 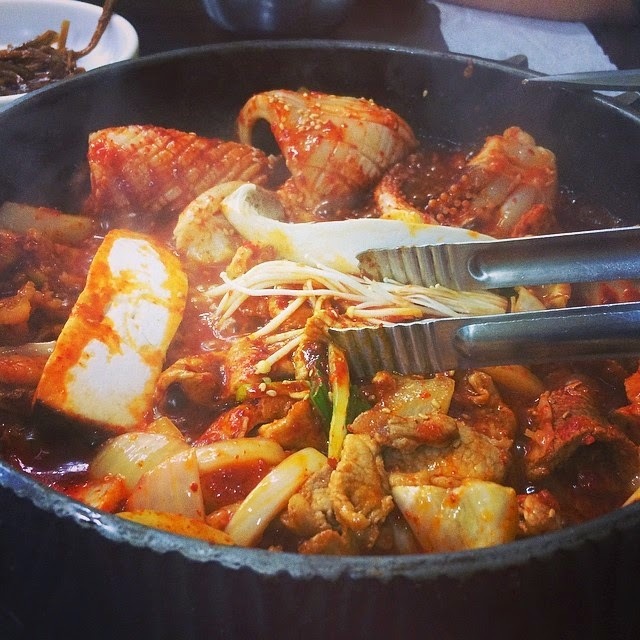 Osam Bulgogi 오삼불고 | is a dish with squid, pork and vegetables marinated in hot pepper paste. This is such a yummy dish with rice! Warning: FOODORGASM! 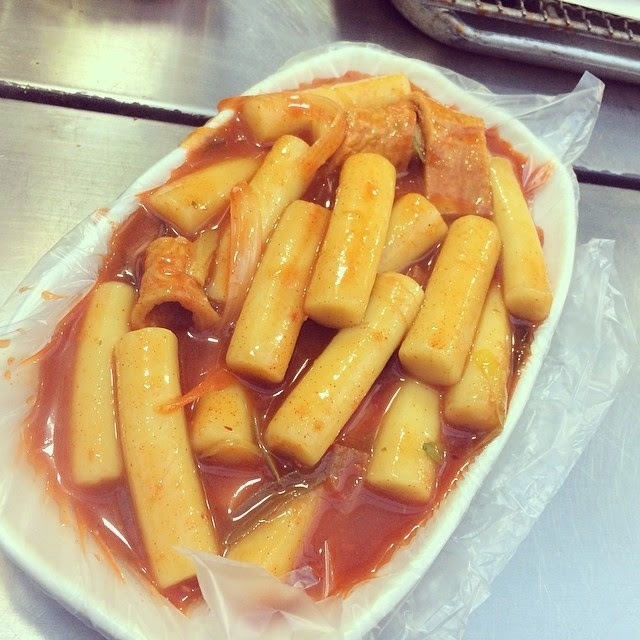 Tteokbokki 떡볶이 | The iconic red chewy streetfood that you always see when you come across streetfood stalls. It's ricecake in red pepper paste with fishcakes. 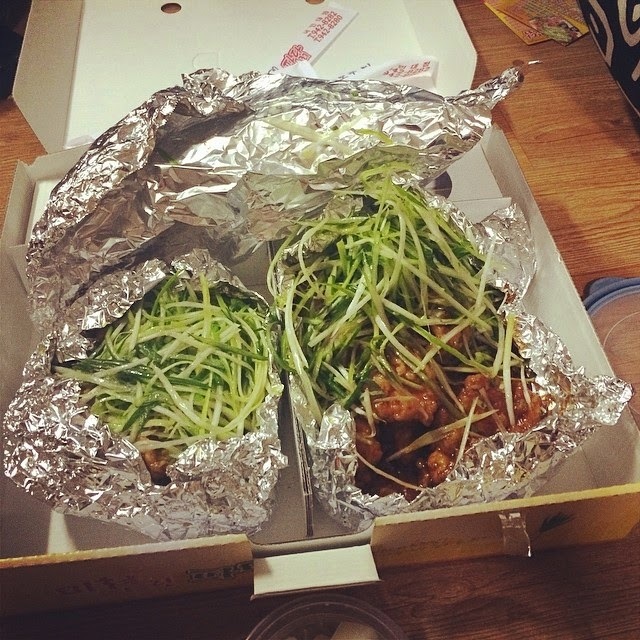 It is a yummy addictable spicy Korean streetfood! 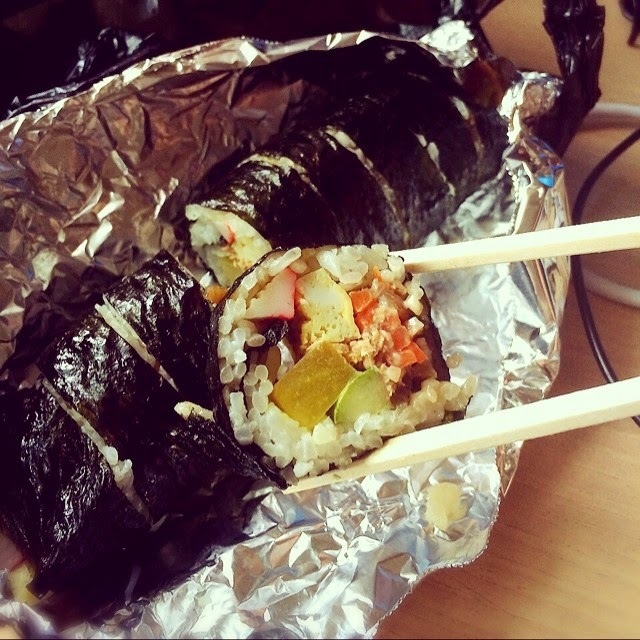 Kimbap 김밥 | Looks like sushi, but is definitely not! No raw fish, but healthy vegetables. 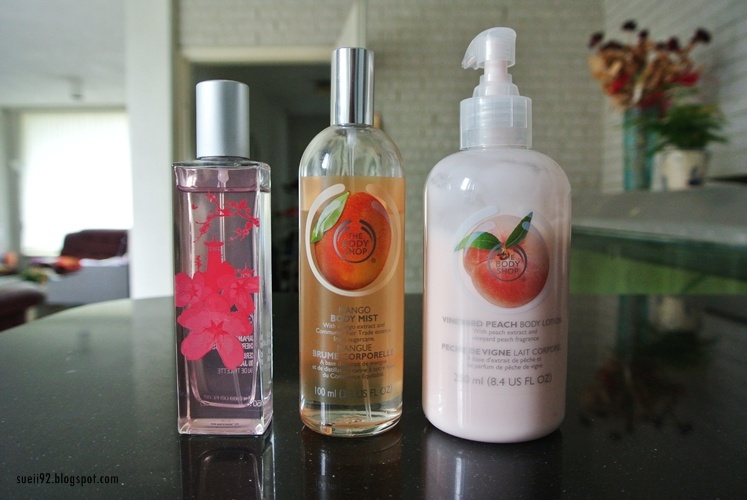 At first I wasn't my favourite, but after I have eaten a few times, I started to miss it! Compared to others dishes, this is definitely one of the most healthy dish to enjoy. It even comes with cheese, but my favourite is with tuna. Bingsu 빙수 | Bingsu ya, Pat Bing su ya, saranghae saranghae ~ There is even a song about it: Bing su! The Korean desert for the summer weather: shaved ice with red bean and various ingredients. The best that I've ever tried are the bing su's from the chain Korean Desert Cafe Sul Bing 설빙. Instead of ice, they use frozen milk which looks like powdery snow thats makes the dessert even more yummier and creamier. Every time I go to Korean restaurants, the epitome of chicken (in a dish) that comes to mind is Korea Fried Chicken haha. But this jjim dak sounds absolutely delicious tossed in japchae! I love samgyupsal, I think there's something very homely eating around others and comfortably with your hands and all, not to mention the awesome free banchan that comes with! I would love some pajeon right now, i'm always tossing up between my two loves of pajeon and okonomiyaki! Vegetable pancakes are the best! I always miss my opportunities to have jjajangmyun, I'm always hearing how hearty it is and I definitely need to remember trying so, I wonder how the Chinese sauce is "interpreted" in Korea. 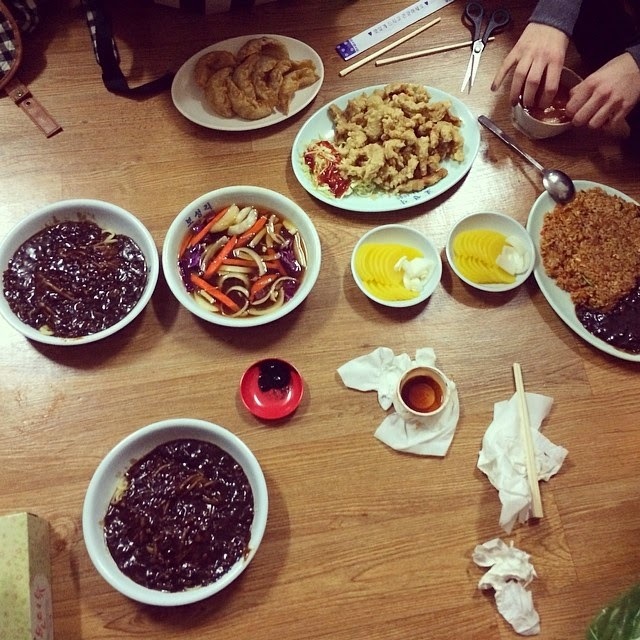 My favourite bulgogi is osam bulgogi, and that photo is making me salivate haha.